With its short working week, safe streets, good public transport, top work-life balance and excellent bicycle infrastructure, it doesn’t matter so much that the weather is crap and taxes are sky high. Copenhagen is simply a damn liveable place. As the political and financial volatility increases in Europe, many of its cities still offer the world’s highest quality of living and remain attractive destinations for expanding business operations and sending expatriates on assignment, according to Mercer’s 19th annual Quality of Living survey. City infrastructure, ranked separately this year, plays an important role when multinationals decide where to establish locations abroad and send expatriate workers. Easy access to transportation, reliable electricity, and drinkable water are all important considerations when determining hardship allowances based on differences between a given assignee’s home and host locations. 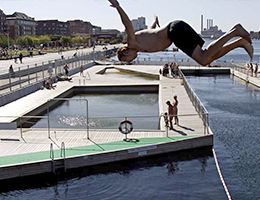 Copenhagen occupies the nineth place for overall quality of living this year, while the rest of the top-ten list mostly filled by European cities: Vienna in first place, Zurich second, with Munich (4), Dusseldorf (6), Frankfurt (7), Geneva (8), Copenhagen (9), and Basel (10). The only non-European cities in the top ten are Auckland (3) and Vancouver (5). The highest ranking cities in Asia and Latin America are Singapore (25) and Montevideo (79). In terms of city infrastructure ranking Copenhagen comes in at no. 4. Mercer’s survey assesses each city’s supply of electricity, drinking water, telephone and mail services, and public transportation as well as traffic congestion and the range of international flights available from local airports. Singapore tops the city infrastructure ranking, followed by Frankfurt and Munich both in 2nd place.